Summer - here we come ! Spring in the Pacific North West had all time record low temperatures - I don't know about you, but I am ready for Summer ! We will be checking out some trips in Europe in July and then again in September and I am personally very tempted to go back to Mexico this fall ... I just can't get enough of it Mexico's landscapes, weather, people and the horses. 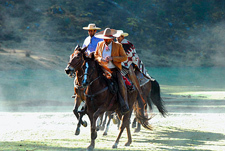 The upcoming rides in Chiaps, Mexico, are extraordinary riding adventures that should not be missed. Both trips on July 15 and July 29 are confirmed and have space for a few more riders ! 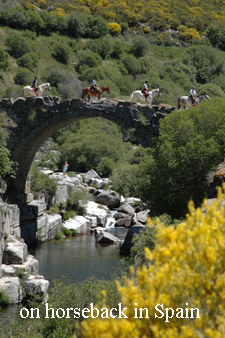 It has everything .... Culture, Breathtaking Landscapes, Great Horses and wonderful guides ! Of course we are also working on our Facebook Fan Page (almost 15.000 Fans) and our website. Have you seen the latest improvements? We have installed a "Favorite" feature that lets you save trips in a "basket" that you can view any time you like, send to your friends or print as a PDF brochure. -- a few spaces are still available for our July 15 and July 29 riding tours in Chiapas ! 20% OFF for Sept 7 departure - limited time offer ! $500 OFF for June or July trips. As always we strive to offer the widest selection of trips all over the world at the most competitive rates. We continuously work on making the search for your perfect trip as easy as possible and improve the reservation process for you. - we created a specail "BEST DEALS" page for you. We collect trip reports from our clients, so you can have a look at the best rides on the "Best Top Trips" page. For all of you that are on Facebook - an easy way to follow us with new Special Offers, new Slide Shows or Videos ... become a fan of our "Facebook Page" - we already have almost 15.000 followers! Look for this sign and use it to keep track of all the trips you like on our website. Check your list any time, send the links to your friends or print them to a digital PDF brochure. 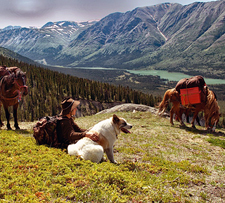 Discover the treasure of the northern Canada landscapes on horseback as you climb majestic mountain ridges, splash across creeks and ride through the peaceful valleys. 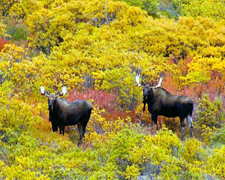 Witness the transformation of seasons in the colorful autumn landscapes of the Yukon Wilderness as the wildlife prepares for another long winter. One of the best rides anywhere will be discontinued. Only 1 trip date left - 2 spaces ONLY ! 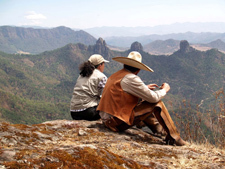 Ride with Pepe and Lucia around the beautiful landscapes of Valle de Bravo.. Looking to find a Travel Buddy to save on transfers or Single rooms - we just implemented a 'new' Buddy Finder on each trip page. Just enter what you are looking for and others can contact you from there. Find your trip here !! What are these riding trips all about? They are about galloping on endless beaches, forging rivers, cantering through forests, trotting along age-old trails, gazing at beautiful vistas, and encountering foreign cultures. Most of all, these trips are about getting away from the cycle of work and never enough free time. Escape from the rituals, which long ago froze our nights and days into little more then routine, because deep inside we all feel the longing of the nomads, whose lives we lived thousands of years ago. Leave your stressful life behind and explore a foreign place away from the tourist rush and off the beaten path - on Hidden Trails. You will see the “real” country, its hinterland and meet the local inhabitants. The love for horses has no boundaries, but possesses a common language we all speak and understand.